I wasn't really interested in doing drag marbles at first. I never wanted to do them then have to wait 30 hours for my nails to dry. Once I started doing them, though, I couldn't stop! I've become a drag marbling fool! 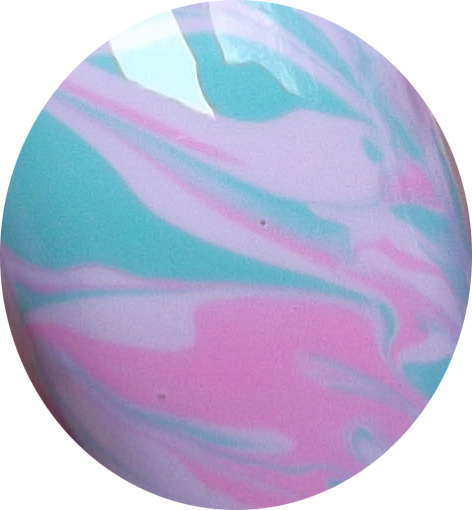 For this marble, I used three China Glaze polishes: Sweet Hook, Dance Baby, and Aquadellic. I was going for a springy look, so I started off with a base of Sweet Hook (pastel purple), then blobbed Dance Baby (pink) and Aquadellic (teal) on top and swirled them around with a fine detailing brush. What I have come to love about drag marbles is that they are relatively quick and simple! You really have to try hard to mess them up and they always look amazing!